He was ernest in anything he signed up to do. Whether it was to attend to patients with heart aliments or caring for family and friends he was there, always. But when it came to sports the earnestness that Dr. Cyril Ernest devoted his energies and talent was legendary. No wonder then that we feature him today as our ‘SPORTS LEGENDS'. In any form of cricket, be it local or international it is essential that every team carry with them an all-rounder or all rounders. An all-rounder is a must because he will be of great importance to the team and above all to his captain. On Sri Lanka cricket and at the time of writing, a close scrutiny will show that there is no all-rounder of repute win the team which is a pity.That coaches and captains don’t lay emphasis on all-rounders is inexplicable. And an all-rounder who shone in all forms of cricket in the 1960s and 1970s was CYRIL ERNEST. More on him as this copy unwinds. He was a hard hitting opening batsman crafty off spinner and a brilliant close in catcher who would pocket blinding catches so to say. Before the country entered the highly prestigious TEST arena, the country had first class all-rounders such as Gamini Goonasena, Ivers Gunesekera, Stanley Jayasinge, Abu Fuard and Neil Chanmugam. They were a team and a captain’s dream. During our time taking to the game in the under-12, to name our coaches Bro. Stanislaus, Bro Condrad and Herman Candappa at St. Benedict’s College, Kotahena would at practice give every player trying for a place in the squad to bat, bowl and also watch in what position we would be best in the field. These coaches would instill in us that that one must endeavor to be an all-rounder. While being a brilliant batsman or a classy fielder or a promising bowler would be appreciated, they would talk to us on the importance of being an all-rounder and explain to us what it would be to a team. Now to CYRIL ERNEST and he was an all-rounder who could have held his own against the best not only in local cricket but international as well. He was a hard hitting right hand opening batsman in the mould of Gordon Greenidge of the West Indies, a right arm off spinner of the likes of England’s Jim Laker and Windies Lance Gibbs, a close in fielder like Australia’s Bobby Simpson. ERNEST began his career at St.Mary’s College, Negombo where he shone like a beacon and then stroked his way to St.Benedict’s College, Kotahena where he debuted under the captaincy of Lionel Fernando in 1959 and the next year under the writer in 1960. ERNEST showcased his talents when as a 15-year old he played for Negombo United in a ‘Daily News’ trophy game and missed a century by just 10 runs against NCC which had the famous G.M. Spittle in the NCC team. Spittle watching the young man in action predicted a bright future for him and he lived up to that. And then making it to the St. Mary’s first side he made 85 against St.Thomas, Kotte and registered three scores of over 50 against St.Anthony’s Wattala, St.Mary’s,Chilaw and Carey College with his best bowling effort being 5 for 33 against St.Anthony’s College, Wattala. Then he played for the Combined Negombo Schools against the Indian schools and was top scorer with 28 and capturing 3 for 14. ERNEST did not want to blow his own trumpet but my urging him made him reveal that he was selected for the Rest team in the schools quadrangular and scored a dashing 66 against a star studded Colombo North Schools team led by Anandian Yatagama Amaradasa. 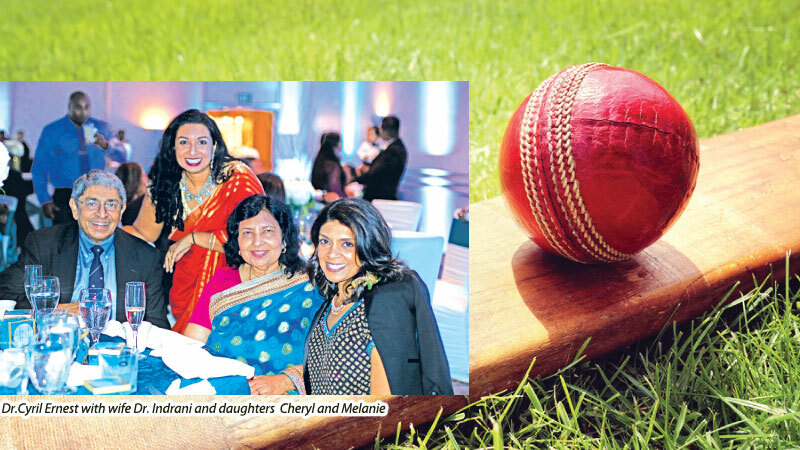 The CNS team had the cream of schoolboys cricketers of that era and to name them were – Neville Casiechetty and Cecil Waidyaratne (SBC), Priya Perera, Raja de Silva and Tissa de Zoysa (SJC), Nihal Amaradasa (Nalanda), Upali Samaratne and L.R. Gunetilleke (Wesley). The next year he was gladly welcomed to St.Benedict’s College and opening the batting his best scores were 64 vs STCML, 57 vs SACK, 71 vs SJC and 70 against St. Anne’s Kurunegala and 50 vs Combined Schools and his best figures were 5 for 31 against Royal. After a successful school season, where he also shone in studies he entered University/Medical School. He captained the ‘Sara’ Trophy side in 1966/67. He also led the University team on a tour of India for the inter-university cricket tourney. His batting highlights in the Uni team were 82 vs. Moratuwa, 55 and 52 against them again, 53 vs SSC, 60 vs Tamil Union, 45 vs SSC which knock helped them win the ‘Sara’ trophy and in bowling he remembers taking 5 wickets against SSC. During his stay at the university doctors who captained the team were Carlyle Perera, Buddy Reid, Lareef Idroos and Mohanlal Fernando and ERNEST too captained the team and he led the team to India for the inter-university tourney in Bangalore in 1966. After winning the ‘Sara’ trophy the Uni rewarded them with a trip to Singapore and Malaysia and against the Negrisembilan state team he made 56 and 49 against Combined Malaysian Armed Forces. He was successful with the ball and had figures of 8 for 99 vs. Malaysia and 6 for 33 against Penang. After graduating from medical school he joined up with the Nondescripts and played for two years with best bowling figures of 8 for 7 against Moors, 6 for 15 against University 6 for 99 against Nomads. Later he quit NCC and threw in his lot with the Air Force where he was a formidable opponent playing for Adastrians captaining the team in 1970 with 139 not out vs Saracens, and again 84 vs Saracens and several other scores of over 30. 5 for 82 and 7 for 38 against Army being his best figures. His most memorable experience was playing for the country under Michael Tissera against Colin Cowdrey’s MCC team in 1969 and capturing the wickets of Colin Cowdrey and Basil d’Oliveira in a game won by Sri Lanka. In a Gopalan trophy game against Madras he scored 45 not out in the second innings to help Sri Lank win that game. He played against Pakistan which team included Imtiaz Ahmed, Javed Burki, Asif Iqbal and Intikhab Alam. He was also selected to play against Pakistan in 1971 but unfortunately the tour was cancelled because of the India - Pakistan war over the formation of Bangladesh. When he migrated to USA it was their gain and big loss to Sri Lanka as a sportsman and doctor. While playing cricket, hockey, being an athlete how he found time for studies that finally ended up in him being a cardiologist much in demand in the US is amazing. In the USA he played for the national team in the Associate Members World Cup in Birmingham, England in 1982. He was manager of the USA team in 1995/’96 and was Chairman of the Selection Committee 1995/’96. He has the rare distinction of playing for two countries Sri Lanka and America. Dr Ernest was a keen long distance runner, running in four marathons –Honolulu twice in 1985 and ’86, Los Angeles 1987 and Bejing 1995 and numerous 5 and 10 kilometre races. In addition he is also a formidable black belter in Taekwondo /Karate. Fellow American College of physicians 1990. He held the position of President Los Angeles County Medical Association in 1984 and served in the Los Angeles County Medical Association Board of Governors. One mishap that is vivid in his mind was when playing for the Rest X1 against Nationalized Services in the Robert Senanayake trophy tournament in 1967 at the Colombo Oval when a Sylvester Dias bouncer when he failed to connect with a pull and had his nose shattered. He was taken to the emergency room in a taxi with blood streaming and had the famous Orthopaedic Surgeon Dr. Reinzie Pieris another Old Ben who reset his displaced nasal bone fracture. But his courage made him to come back and continue batting making 48. ERNEST also presented a Bowling Machine to St. Benedict's college cricketers. Dr. Ernest was here recently for the BenedictIne Prize Giving as chief guest with his wife Dr. Indrani and daughters Cheryl and Melanie and it raised goose flesh meeting him with cheer leader of that era Kenneth Daberera and team mates Ranjit Fernando and Anton Abeysekera going down memory lane and recalling anecdotes of old. I am so pleased Sanath has found the information and Lucky has published this most interesting and valued account of a friend who is one of life's true gentleman. In modern parlance he could be described as a fine sportsman and a polymath but still remains modest and down to earth. I can well believe he has had a most rewarding career in the noble profession. My strictly limited talent for playing cricket meant I would be forever a spectator. I was a veteran spectator of school cricket while at Wesley. I have followed Cyril's fortunes as he was such a fine all round cricketer. I do recall one of the finest games I have watched, Royal V St Benedicts, played at Reid Avenue in the late 1950's which Royal won in a thriller despite a valiant 80 by Quintus Perera and a 5 wicket haul by the young Cyril Ernest. This will remain in my memory forever for the thrills and the spills and spirit in which it was played. Then I watched Cyril's masterly performances in the fine University team that won the Sara Trophy. I had the good fortune to meet Cyril in 2012 in the plush lobby of the Cinnamon Grand when he was with Lareef Idroos and I was with Senthil Sinniah who captained Wesley College in 1959. Once again their modesty shone through although I was embarassed not being able to recognise either Cyril or Lareef. I blame my bilateral cataracts from years of radiation!! May we have the good fortune to meet again. I now live in the shadow of the Lords Cricket Grounds and a fortunate recipient of a season ticket for all the games. As I watch them, in the home of cricket, with my glass of champagne my mind often returns to those halcyon days in sunny Ceylon watching games under the spreading 'Mara' trees. My thanks to Elmo Rodrigopulle that veteran Benedictine cricketer for bringing those wonderful memories so palpably close to us all. That is a lovely picture of the family. Most importantly Cyril has always remained the same modest, steady guy, an ardent catholic who never carried his religion on his sleeve but practiced it quietly . A great family man too. As much as I am into cricket I did not know his achievement in taking the wickets of Cowdrey and D'Oliviera. We are always learning,thanks Sanath. I missed that match. Cyril,made a visit to my residence in Edgbaston,when he came to play cricket in Edgbaston,grounds,representing USA.He was with his charming wife,Indrani,greeted by BL&his wife Shanti,Lawrence Ratnam from 1960 batch.The group photo taken on that occasion is still in my custody.He made it a point to visit chocolate factory,in Bournville,before his return to US. During my stay in Bloem,Cyril too,was a resident.We had hardy any time to have a chat,purely because of his devotion to cricket.He was too tired at the end of cricket practice.I,was never aware of early achievement in sports,in the earlier days,as he is not a man who blew his own trumpet.Later in life,he has reached the zenith in academia and in sports,which all of us are proud of.Mother,Lanka,lost lost lot of talented,sons&daughters since 1956.Do,current day politicians,genuinely,appreciate the achievements of people like,Cyril. He deserves to be an honorary member of Sri lankan cricket board. I,wish him excellent health&happiness,in life in USA. Well said Sumathi. SL has lost so many talented people because sadly, most decent people kept away from Politics. Am I being too hard on them? Cyril, It is evident that you have been a true all- rounder ! Sanath and Lucky- thank you. So pleased to see my good friend Cyril being given the recognition he deserves. Readers may recall that he was my first subject in the Speedy interview series and a lot of material was covered in that interview. i would sum him up as supremely talented.modest, humble, friendly,understanding, kind and all rounder in the Big Game, the Game of life. It is indeed a privilege to know him. I got to know Cyril in 1961 when we both did Chemistry in the 6 months course. Of course I had heard about him before that, because he was a reputed schoolboy cricketer playing for St. Benedict's. I was indeed proud to sit with him in the same lecture hall in the Science Faculty. What others might not know is in this little story. My brother who is now in San Jose, CA was also an avid cricket fan and used to collect newspaper clippings as a young boy. When he left SL in 1977, he left behind his vast collection with me. When I too left SL "for good" in 1997, I left a whole stack of SL newspapers and other things in a wooden crate in the basement of our Kirillapone house. It must be still there because a friend of my son is now occupying the house. I distinctly remember that there was something like a supplement where pictures of St. Benedict's cricket team and Sister Colleges cricketers were featured giving publicity to what used to be am annual match. I remember that Cyril was in one photo while Senerat (RS) Jayatilake, Razaque (reperesenting St. Anthony's, Wattala and one other (was it George Fabian Perera) who all entered the Medical Faculty. Senerat was repesenting St. Anne's, Kurunegala and the third one was from Maris Stella College. I am sure Razaque or Cyril himself will be able to tell us more about this match.